Happy Sunday! I am sure this verse is familiar to many, but how many of us actually BELIEVE it and live by it? So many times we walk around defeated, we think things are never going to change, we see only the impossibilities of a situation. And if we are looking at things with only our human limitations then a defeatist attitude is understandable. BUT, God tells us that with Him ALL things are possible--He changes impossible, seemingly unchangeable circumstances. 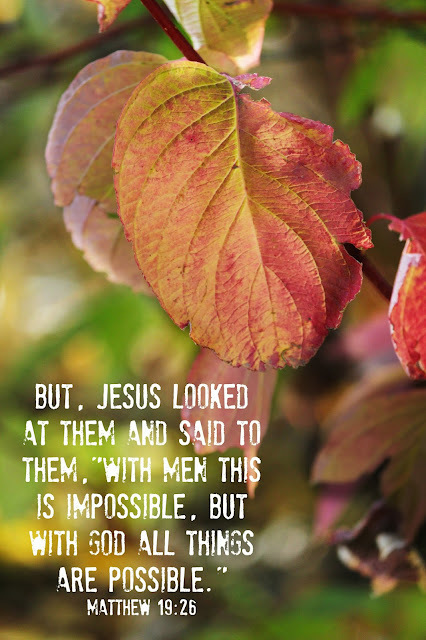 This week instead of looking at things with our eyes, let's use our Jesus vision to see the possibilities! Thanks so much for this post. Yes, I know that verse, but life has been getting me down and I am weary. 'He' is able and I seem to forget that. Bless your week. I am glad you were encouraged!